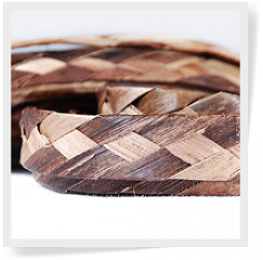 Sunset Bamboo's all natural Rope and Braids are harvested from carefully selected material derived from palm leaves, banana barks and other leaves and is offered as Sennit Rope, Bac Bac, Rumba and Sea braids. We have carefully identified providers of the best earth friendly products to offer. The detailed weaving process is done by artisans and only after a long preparation of the leaves that include drying them in the sun, removing the thorns, cleaning the leaves one by one in the ocean, then softening and flattening them. Sunset Bamboo is proud of the work we do supporting indigenous cultures through our purchase of their hand woven products. 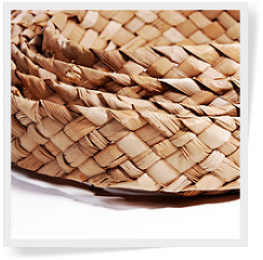 Ropes and braids are constructed from the same materials and processes used to create our matting products. These thin strips create endless possibilities for home design use, particularly decorative trimming. Bamboo ropes and braids have all of the functionality of traditional ropes along with eco-friendly qualities, extended durability, and tropical designs. The material for the ropes is obtained from different plants like palm, banana bark and other leaves. The process to prepare the ropes is very long and includes drying leaves, removing the thorns, cleaning the leaves one by one, then softening and flattening them out. Although it is quite a tedious process, the end result is well worth it as it makes the ropes very high quality and durable. 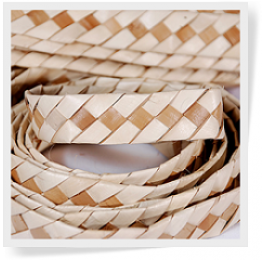 Our bamboo ropes and braids are made from sustainable and natural materials, which makes them a great choice to use, as they are great for the environment, easy to harvest and recycle. These particular bamboo ropes and braids are extremely versatile because they can be used in a multitude of different ways for projects inside and outside of the home. Because of their tensile strength, they can even be used for dragging or lifting heavy items. Some popular uses of these ropes and braids are to add an Asian inspired theme and rustic decor to all of your projects. You could use it to trim your walls, windows, frames, mirrors, posts, the classic tiki bar or to accent almost anything in your home or garden space. Ropes can accompany your projects in both 1” x 100’ and ¾” x 150’ sizes. Braids are available in ¼” x 50’, ½” x 150’, ¾” x 150’, ½” x 600’, and ¾” x 600’ pieces. Your backyard can sport designs from cultures in different parts of the world. No matter where you are in the country, we offer free shipping with our top of the line ropes and braids.